NEWPORT, Ky. — Newport Aquarium invites the public to experience a holiday celebration under the sea Nov. 25 – Dec. 31 at Water Wonderland with Scuba Santa®. Newport Aquarium is the only place where families can celebrate the holidays under the sea as Water Wonderland with Scuba Santa® blends the thrill of indoor bubble showers and the intimacy of uniquely holiday-themed galleries with the tradition of Scuba Santa®, who has delighted guests since 2003. Shark Ray Bay – Guests will be surrounded by lights, bubbles and holiday music as they join one of Scuba Santa’s elves in song and discover how some of Newport Aquarium’s most iconic animals celebrate holidays under the sea. Children will have the unique opportunity to meet Scuba Santa® one-on-one as he dives inside the 385,000-gallon Surrounded by Sharks tank and tell him their holiday wishes. Seahorses: Unbridled Fun – Hundreds of twinkling sea-creature lights will hang from the ceiling of the Seahorses: Unbridled Fun exhibit as guests experience holiday music and magical bubbles while enjoying some of nature’s most amazing creatures, such as trumpet fish, pipefish and several different species of seahorses and sea dragons. Gator Alley – Honky-tonk holiday lighting, music and decorations welcome guests at Gator Alley, the home of Mighty Mike – the biggest and baddest alligator in the country outside of Florida at 14 feet and 800 pounds – as well as Snowball and Snowflake, two of less than 100 white alligators in the world. * Scuba Santa® will not be diving on Christmas Day – he’ll be resting after a busy night traveling to homes all around the world. Buy 3, Get 1 Annual Pass Sale: In time for the holidays, guests who purchase three Newport Aquarium Annual Passes will receive a fourth Annual Pass free. The Annual Pass Holiday Special ends on Jan. 2. Existing Newport Aquarium Annual Passholders can renew their passes during this promotion to receive $3 off the renewal rate for even more savings. Newport Aquarium, named one of the top U.S. aquariums in 2016 by Leisure Group Travel, and voted the No. 1 aquarium in the country by USA Today’s 10Best.com in 2012, has showcased thousands of animals from around the world in a million gallons of water since 1999. Named a top U.S. aquarium by US City Traveler and Destinations Travel Magazine in 2014, and also by Travel Channel in 2013, Newport Aquarium is a Herschend Family Entertainment company and an accredited member of the Association of Zoos and Aquariums. Newport Aquarium is open to the public 365 days a year and is located across the Ohio River from downtown Cincinnati at Newport on the Levee. Walking through the Water Wonderland with Scuba Santa, it’s impossible not to feel like a kid again. At Newport Aquarium, we invite you to experience the holidays under the sea in a brand new way. For more than 10 years, Scuba Santa has been delighting the greater Cincinnati area, and now the entire aquarium is joining in the holiday cheer. This year was Sophia’s first time meeting Scuba Santa. Five years old, she was filled with nervous anticipation as she waited in line to see the big man himself. She had been drawn to Shark Ray Bay by the sound of Scuba Santa’s elves singing Jingle Bells and laughing happily, but now that she was here, it all seemed a little bit overwhelming. As she got closer to the front of the line, something distracted her: bubbles were falling from the ceiling! Catching and popping bubbles, she almost didn’t realize it was her turn. Although Sophia wasn’t quite sure what she wanted when Scuba Santa asked, there was a place for her to write down her Christmas wish on a bubble near the Penguin Palooza. Meeting Scuba Santa was most certainly one of her favorite holiday memories. And it’s one she will probably repeat every year. Making fantastic memories and new traditions is easy with Newport Aquarium’s holiday celebration. With festive, holiday-decorated exhibits, families of all ages are able to experience Christmas, while at the same time exploring the ocean. Decorated galleries include Shark Ray Bay featuring Scuba Santa, Bizarre and Beautiful Gallery, Gator Alley, and Penguin Palooza. The first exhibit you’ll encounter is the Bizarre and Beautiful Gallery. Featuring hundreds of lights twinkling from above as beautiful sea creatures weave their way through, it’s impossible to not feel wonder at the strange creatures in this beautiful setting. Holiday lights and festive fish decorate the Bizarre and Beautiful Gallery during Water Wonderland with Scuba Santa. Gator Alley is home to Mighty Mike, the largest Alligator outside of Florida. After warmly welcoming Snowball and Snowflake, the white gators, in 2013, he generously agreed to share his home with bright, colorful lights and some mischievous reindeer. Penguin Palooza captures the excitement of Christmas, with penguins flitting in and out of the water and playing with snowmen, while children have the opportunity to write letters on magic bubbles to Scuba Santa. From chasing and playing with the bubbles filling the front lobby, to meeting Scuba Santa and exploring Newport Aquarium’s underwater celebration, Water Wonderland with Scuba Santa is an experience the whole family will enjoy. Plus, you can experience the offering of the aquarium’s more than 10,000 animals. Scuba Santa greets kids while diving in the aquarium’s 385,000 gallon Surrounded by Sharks exhibit, the home of nearly two dozen sharks. This Christmas, combine the classic traditions of meeting Santa Claus and listening to beloved Christmas music with the magic of the holidays under the sea and connecting with your family and friends. For more information on Newport Aquarium, or to purchase tickets, visit NewportAquarium.com or call toll free 800-406-FISH (3474). Connect with Newport Aquarium on Facebook and Twitter, or subscribe to its blog, for the most up-to-date news on Newport Aquarium. Newport Aquarium has showcased thousands of animals from around the world in a million gallons of water since May 15, 1999. Named one of the best aquariums in the U.S. by Travel Channel and USA Today, Newport Aquarium is a Herschend Family Entertainment company and an accredited member of the Association of Zoos and Aquariums. Newport Aquarium is open to the public 365 days a year and located across the Ohio River from downtown Cincinnati at Newport on the Levee. NEWPORT, Ky. — Newport Aquarium welcomes the public to experience a holiday celebration under the sea Nov. 27-Dec. 31 at the all-new Water Wonderland with Scuba Santa®. Newport Aquarium is the only place where families can celebrate the holidays under the sea as the all-new Water Wonderland with Scuba Santa® blends the thrill of indoor bubble showers and the intimacy of uniquely holiday-themed galleries with the tradition of Scuba Santa®, who has delighted tri-state folks since 2003. At Newport Aquarium’s Water Wonderland with Scuba Santa, kids will have the opportunity to talk with Santa while he’s underwater! Shark Ray Bay – Guests will be surrounded by lights, dreamcicles, bubbles and holiday music as they join one of Scuba Santa’s elves in song and discover how some of Newport Aquarium’s most iconic animals celebrate holidays under the sea. Children will have the unique opportunity to meet Scuba Santa® one-one-one as he dives inside the 385,000-gallon Surrounded by Sharks tank and tell him their holiday wishes. Bizarre and Beautiful –Twinkling sea-creature lights will hang from the ceiling of the Bizarre and Beautiful exhibit as guests experience holiday music and magical bubbles while enjoying some of nature’s most amazing creatures, such as Japanese spider crabs and a giant Pacific octopus. Additional holiday surprises will delight guests during their journey through the aquarium. Reach Magazine $5 Child Ticket: Inside its December issue, Reach Magazine will offer its Cincinnati readers a coupon for $5 admission to Newport Aquarium for children ages 2-12, a nearly 70 percent discount. This offer is valid only for visits Monday-Thursday from Nov. 30-Dec. 24 and can only be redeemed at the Newport Aquarium ticket window (no online or offsite redemption). Buy 3, Get 1 Annual Pass Sale: In time for the holidays, guests who purchase three Newport Aquarium Annual Passes will receive a fourth Annual Pass free. The Annual Pass Holiday Special ends on Dec. 31. Existing Newport Aquarium Annual Passholders can renew their passes during this promotion to receive $3 off the renewal rate for even more savings. 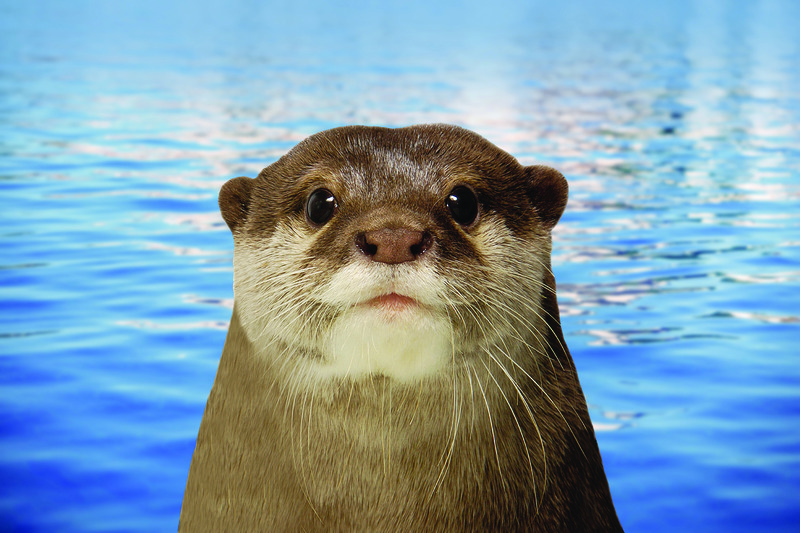 Aquarium’s 2015 exhibits lineup to include – back by popular demand – Otters! NEWPORT, Ky. – Newport Aquarium announced Wednesday an exhilarating 2015 lineup of coming attractions, featuring Shark Bridge, the only suspension bridge in North America where guests can walk just inches above nearly two dozen lurking sharks. Scheduled for a mid-April opening, Shark Bridge is a 100-foot-long, V-shaped rope bridge suspended over the waters of the Surrounded by Sharks exhibit’s 385,000-gallon tank. Shark Bridge will be the first of its kind in North America. 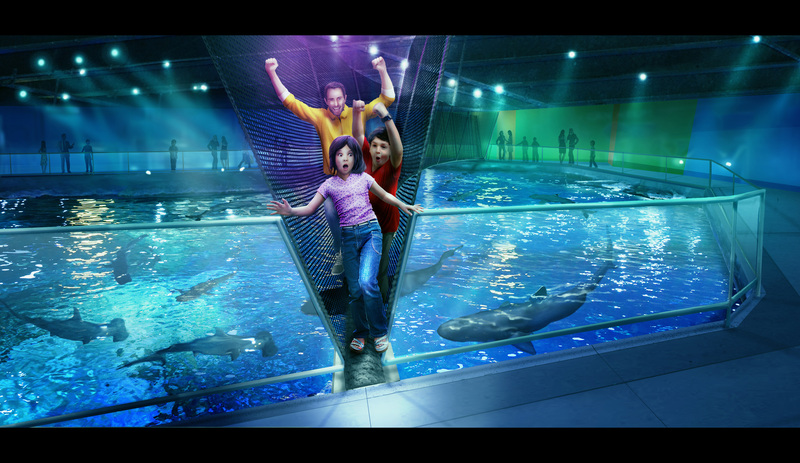 Should guests dare to cross, Shark Bridge will offer an exclusive adventure and unique perspective of walking closely atop seven species of sharks, four rare and exotic shark rays, multiple stingrays and more than 300 fish. The addition of Shark Bridge will triple the viewing area above the Surrounded by Sharks tank prior to guests exiting the aquarium. Coinciding with the opening of Shark Bridge in mid-April, extremely rare scalloped hammerhead sharks will be added to the Surrounded by Sharks exhibit. Newport Aquarium will be the first institution in North America to exhibit multiple scalloped hammerhead sharks. This exhibition of scalloped hammerheads will help communicate the species’ conservation message to the public. 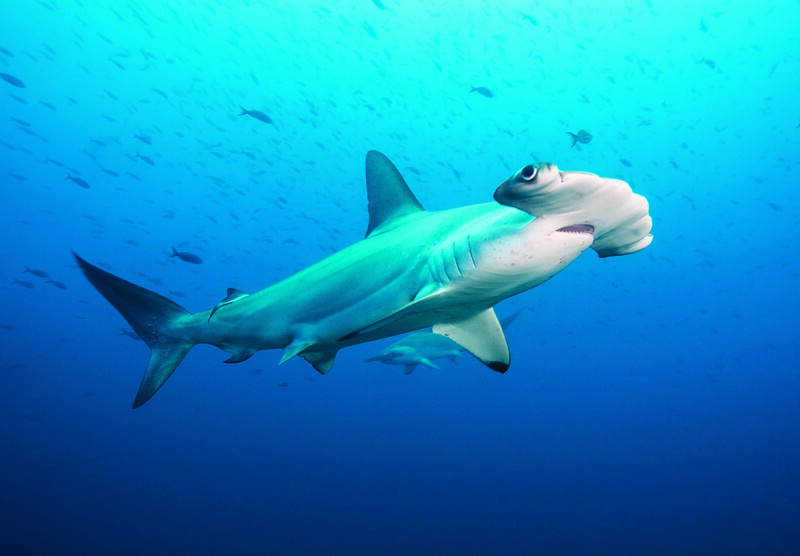 Newport Aquarium is working with field researchers from Hawaii, where the new hammerheads originated, to educate the public about scalloped hammerhead conservation. The scalloped hammerheads will join 17 other sharks currently in the Surrounded by Sharks exhibit that include sand tiger, zebra, sandbar, blacktip, whitetip and nurse sharks. Coming in mid-March, Newport Aquarium will open its newest exhibit, Canyon Falls, which will occupy the area that currently houses the Turtle Canyon exhibit. Canyon Falls will be the new home to Asian small-clawed otters, which are back by popular demand after the aquarium previously exhibited otters from 2004 to 2013. Asian small-clawed otters are returning to Newport Aquarium in mid-March. Newport Aquarium will offer scheduled otter talks at Canyon Falls that provide guests educational opportunities to learn more about otters and otter conservation. Other additions to Canyon Falls include two species of lizard never before seen at Newport Aquarium – yellow monitor, a rare and active tree-dwelling lizard from Indonesia, and panther chameleon, one of the most colorful lizards in the world from Madagascar. Remaining in Canyon Falls will be Thunder, a more than 100-year-old snapping turtle and Newport Aquarium’s oldest resident, as well as the Turtle Corral, where guests have the unique opportunity to touch several species of tortoises. Mermaids from Weeki Wachee Springs, Fla., will return to Newport Aquarium in October. The announcement of their return comes on the heels of their wildly popular 10-day visit to Newport Aquarium in October 2014, which was the 67-year-old institution’s first visit to the Midwest. Weeki Wachee Mermaids will make a second engagement at Newport Aquarium in October. Further details of Weeki Wachee Mermaids returning to Newport Aquarium will be announced on a later date. A newly reimagined Scuba Santa’s® Water Wonderland will return for its 13th season on Nov. 27. The 2015 edition of Scuba Santa® promises to offer guests new features and experiences. Further details will be provided on a later date. A newly re-imagined Scuba Santa’s Water Wonderland will make its debut in November. White American alligators Snowball (left) and Snowflake were delivered to Newport Aquarium from Scuba Santa as part of his 10-year anniversary celebration. NEWPORT, Ky. – In celebration of the 10-year anniversary of Scuba Santa’s® Water Wonderland, world-renowned Scuba Santa revealed Tuesday a pair of rare white American Alligators for Newport Aquarium. The white alligators, Snowflake and Snowball, will call the Rainforest Exhibit their home throughout the Water Wonderland experience, which runs Nov. 29, 2013, through Jan. 1, 2014, except for Christmas Day, when Scuba Santa rests from his big night. Each gator measures roughly six feet in length, with the female Snowflake weighing approximately 65 pounds and the male Snowball weighing 85 pounds. 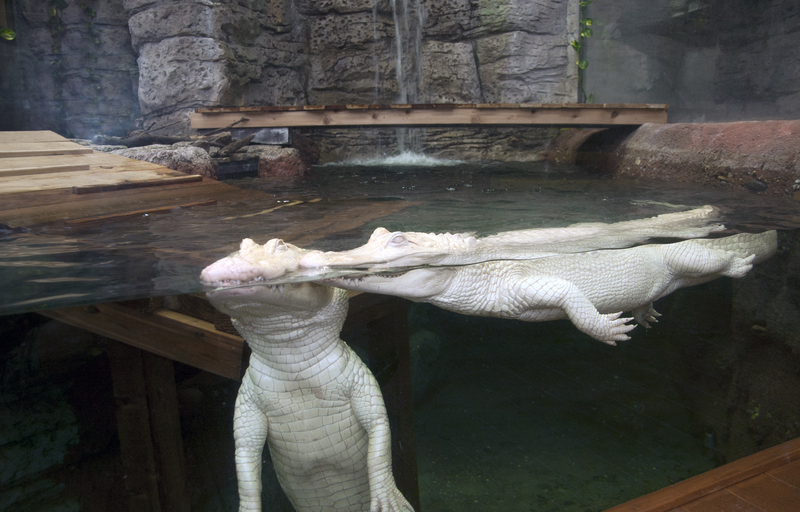 In Newport Aquarium’s constant efforts to offer guests more new to see and do, Snowflake and Snowball are two of less than approximately 100 known white alligators in the world. The Scuba Santa® Water Wonderland – which has been featured on ABC’s “Good Morning America”, NBC’s “The Today Show”, CBS’ “The Early Show”, USA Today and The New York Times – is one of the tri-state area’s favorite holiday traditions. The Kentucky Travel Industry Association has named it a Winter/Holiday Top 10 Festivals & Events in each of the past two years, and five of the last nine overall. Scuba Santa® and his magical underwater sleigh, seahorses and Pixie the elf will delight and amaze while inside a 385,000-gallon tank filled with tiger sharks, zebra sharks, stingrays, four rare and exotic shark rays, as well as a very curious 200-pound loggerhead sea turtle named Denver. The dive show features Scuba Santa entertaining the audience from beneath the sea, highlighted by a special underwater reading of “Twas the Night before Christmas” from Santa’s Magic Story Book. Annual Pass Sale: In time for the holidays, guests who purchase three Newport Aquarium Annual Passes will receive a fourth Annual Pass free. The Annual Pass Holiday Special ends on Dec. 31. Existing Annual Passholders can renew their passes during this promotion to receive $3 off the renewal rate for even more savings. For more information on Scuba Santa’s Water Wonderland and the white gators, visit www.newportaquarium.com or call 800-406-3474. NEWPORT, Ky. – To celebrate his upcoming 10-year anniversary as a global holiday icon, the world-renowned Scuba Santa® presented Newport Aquarium with two special-delivery gift packages on Friday, Nov. 8 – three weeks prior to the launch of Scuba Santa’s Water Wonderland show on Nov. 29. A pair of large white wooden crates – each measuring more than 8 feet long, 3 feet wide and 2 feet tall – were sent from the North Pole by Scuba Santa, and are currently on display at Newport Aquarium’s main entrance on the plaza of Newport on the Levee. The contents of the two boxes will be revealed for the first time at a private Annual Passholders sneak preview the evening of Tuesday, Nov. 26, and will be on display to the public for a limited time starting Nov. 27. The region’s most unique family-fun holiday tradition since 2003, Scuba Santa’s Water Wonderland will be open to the public from Nov. 29 through Jan. 1, 2014. 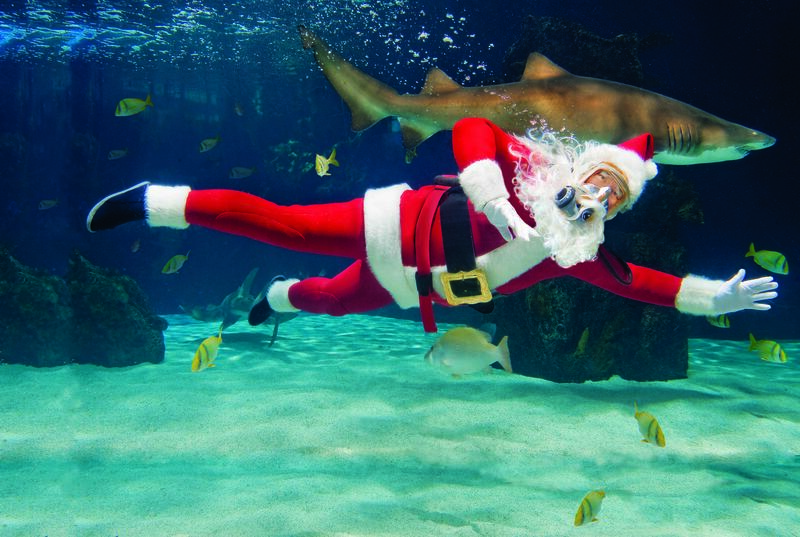 Scuba Santa, along with his magical underwater sleigh, seahorses and Pixie the Elf, will entertain and delight guests in 350,000 gallons of water while surrounded by Shark Rays, Tiger Sharks, eels and Denver the Sea Turtle. The dive shows feature Scuba Santa performing from beneath the sea, highlighted by a special underwater reading of “Twas the Night Before Christmas” from his Magic Story Book. Scuba Santa’s Water Wonderland – which has been featured on ABC’s “Good Morning America”, NBC’s “The Today Show, CBS’ “The Early Show”, USA Today and The New York Times – is one of the Midwest’s favorite holiday traditions. The Kentucky Travel Industry Association has named it a Winter/Holiday Top 10 Event in each of the past two years, and five of the last nine overall. Delighting families since 1999, Newport Aquarium is the No. 1 aquarium in the country according to USA Today’s 10Best.com; a 2013 Travel Channel top U.S. aquarium; and a 2013 Lexington Family Magazine Family Favorite Day Trip. A top tri-state destination, the state-of-the-art facility is an accredited member of the Association of Zoos & Aquariums (AZA), a leader in global wildlife conservation. For more information on Scuba Santa’s Water Wonderland, including show times and pricing, visit www.newportaquarium.com or call 1-800-406-FISH (3474).